For all men who were ignorant of God were foolish by nature; and they were unable from the good things that are seen to know Him who exists, nor did they recognize the Craftsman while paying heed to His works . . . For as they live among His works they keep searching, and they trust in what they see, because the things that are seen are beautiful. St. Bernard was traveling with a poor, uneducated farmer, who noticed that the abbot kept his eyes cast downward. When the farmer asked why the saint wasn’t looking at the beautiful countryside, Bernard explained that he wanted to avoid distractions while praying. Almost everyone experiences distractions of some sort while praying, as St. Bernard managed to demonstrate to the farmer (so the man ended up joining him in the monastery). Occasionally we hear of someone so deep in prayer that nothing can take his or her attention away from God. Much more common, however, is the experience of the seventeenth-century religious St. Margaret Mary Alacoque, who had difficulty meditating in the formal way expected of the sisters. A more attractive method of dealing with distractions — and one much easier for us to imitate — was practiced by St. Francis of Assisi. Whenever he was about to enter church for Mass or to pray, he would say, “Worldly and frivolous thoughts, stay here at the door until I return.” Then he would go inside and pray with complete devotion. St. Bernard, who sought to avoid distractions of the eyes while praying, once had a vision in which he saw an angel in Heaven writing down in a book the words of the Divine Office (the official community prayer of the Church) as they were prayed by his fellow monks. Some of the words were written in gold by the angel, and Bernard was given to understand that these represented the perfect fervor with which they were said. Others were written in silver, symbolizing the pure intention of the one praying, even if he was distracted. Still other words were written in ink, denoting the laziness that accompanied them. This article is from a chapter in Saintly Solutions to Life’s Common Problems. Fervent prayer is truly focused on God. Sometimes, however, in spite of our best intentions, distractions come, and our efforts to force our attention back to God seem only to make matters worse. A twentieth-century mystic, favored with conversations with Jesus, mentioned this difficulty to Him. Our Lord is said to have told her that distractions in prayer may be compared to a dog accompanying its master on a walk in the woods. The dog runs ahead, goes about sniffing and exploring, returns to its master for a moment, runs off again, returns briefly as if to check on its master, then runs ahead yet again. In the same way, Jesus explained, when we find our minds wandering away from our Master during prayer, we should gently return, without guilt or fear, and as often as necessary. To achieve this, we should begin by following the simple advice of St. Teresa of Avila: “Never address your words to God while you are thinking of something else.” God is worthy of our full attention. It’s admirable to pray as we work or while we drive or do other things — as long as we make the Lord’s presence central to the experience and not an afterthought. This edifying story is one most of us can relate to, and it suggests a solution to our own difficulties: making our distractions part of our prayer. As St. Thérèse of Lisieux stated, “I have many distractions, but as soon as I am aware of them, I pray for those people, the thought of whom is diverting my attention. In this way, they reap the benefit of my distractions.” This simple approach is one we can easily follow; we need only get into the habit of consciously incorporating every thought that comes to us in prayer into our conversation with God. Prayer doesn’t have to be only about “holy” and “spiritual” things; Jesus wants us to share with Him our entire lives, including our joys and interests, our plans and concerns, our worries and feelings. Talking to Him in a very loving and comfortable way, just as we would with any other friend or loved one, can be a helpful means of overcoming distractions. St. Teresa of Avila suggests that, at the beginning of prayer, we close our eyes “in order to open wider the eyes of the soul,” thereby lessening the chance of distractions. 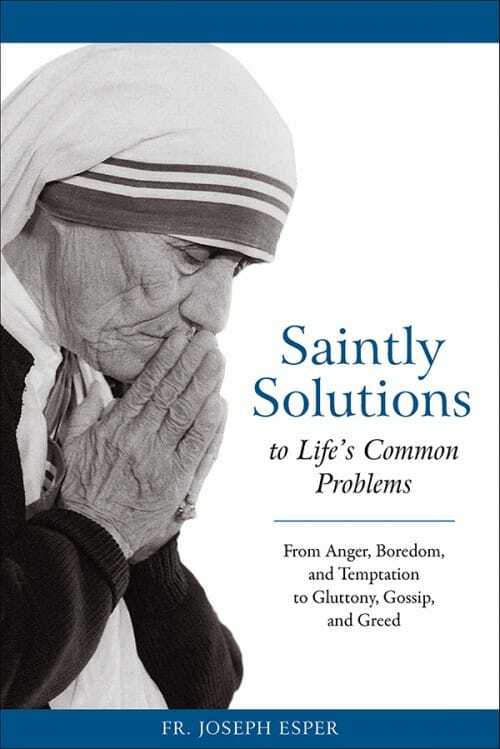 Editor’s note: This article is from a chapter in Fr Esper’s Saintly Solutions to Life’s Common Problems which is available from Sophia Institute Press.